A banner is an important tool for the marketing of businesses. Display the banner at your business to showcase yourself or take it to marketing events, trade shows, and conferences. A well-designed banner gives people a refreshing glimpse of your organization in quick few seconds. Once you explore our portfolio, you will find many high quality banners. 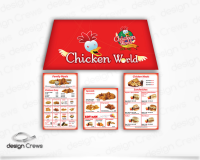 We offer the most beautiful banners design in the market with the guarantee of 100% customer satisfaction.